Just when we thought we had a few "conscious" rap artists in he United States. In Senegal, rappers are demonstrating what it really means to make music with a purpose. They're not just participating in but are also leading a movement against the country's aging president, who does not want to leave office, the New York Times reports. In the former French colony in Northern Africa, there were riots this summer with tear gas and tire burnings, as well as several large demonstrations. One of them forced President Abdoulaye Wade to back away from constitutional changes that would almost ensure his third term in office. 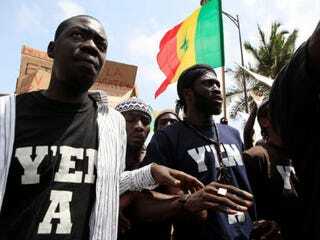 At the forefront of the movement has been a surprising group: rappers like Fou Malade (real name: Malal Talla) and Thiat (Cheikh Oumar Cyrille Touré). "In politics, nothin' but hypocrites, robbers of cash. Government, why do you always lie, always?" says rap Fou Malade in the song "We're Going to Tell Everything." They continue, comparing the state to a small, traditional fishing boat: "The pirogue is sinking, and whoever dares say it spends the night at the D.I.C.," referring to the Criminal Investigations Division. The movement's objective is simple, Fadel Barro, a friend of the rappers', told the New York Times. "That they stop making futilities priorities, like the Monument de la Renaissance" — a giant statue — "or buying new planes. We're fighting so that the preoccupations of the Senegalese return to the center of politics." In other news: 'Nig**s in Paris': Can White People Say It?